Picture this: me, a snooty food critic who only speaks English in a French accent, although I don’t actually speak French. Think scary guy from Ratatouille, that’s me. The weight of the culinary world rests on my stooping shoulders. 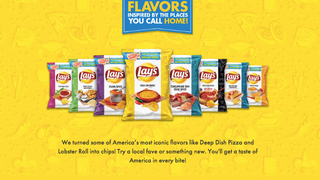 I am here, at this candlelit table, to review the eight new chip flavors that Lay’s just announced. A cowering Lay’s executive puts a plate of chips in front of me. I snort under my breath, and he runs away, whimpering. I take a single chip in my spindly fingers, and bring it to my mouth. But not me. I know the power of the flavor dust. Hand me a 13 oz. bag of Tostitos Hint of Lime and I will happily burn my own tastebuds off for hours. At least a child, having touched a hot stove, knows to keep his fingers away. Me? I return again and again to the Crunch XXTRA Flamin’ Hot Cheetos with gleeful abandon. How many hours, days have I spent hunched over a screen, goblin-like, shoveling chips into my mouth? It must be millennia, for I am ageless. How many varieties of potato-adjacent matter have I tried? Countless, and I remember the distinct crumb coating of each one, covering my fingers in a thick layer of delicious grime. So welcome, I say to these eight new bastions of modern snack-dom. Come one, come all. Thai Sweet Chili? Yes, of course. Cajun Spice? Why not. Deep Dish Pizza inspired by Giordano’s TM? I’ll take it.